More than three-quarters of Australia’s population lives within 50 kilometres of the coast – we love living on the edge. But what does this mean for our cars? The fact is that Australian conditions can wreak havoc on the condition of our vehicles, with the paintwork in particular doing it tough in the face of damaging forces such as the sun, pollution, particulates, rampaging bats, birds and bugs, and other nasties. Oxidation and premature fading of your car’s paintwork are the most obvious outcomes of these unwanted external attacks and, unfair as it may seem, you can hardly blame people for judging a book by its cover. Even if your car is in great mechanical condition, that patchy, peeling skin effect - especially on the bonnet and roof - cannot help but detract from its appearance and value. Oxidation doesn't happen all at once; it's a process that sets in over time. Fortunately, protective measures are relatively simple, won’t break the bank and can keep your car looking as good as new for longer. Parking undercover whenever and wherever possible will keep those pesky UV rays at bay and should put paid to all but the most determined bats, birds and their judgmental bowels. All that leaves is the difficulty of finding a parking space under shelter, shelling out the astronomical cost of parking fees, and cursing the fact that not everyone is blessed with a garage or carport at home. To alleviate these issues, investing in an all-weather car cover is a good move. The main thing to remember is this: just as we slather on the sunscreen to protect our skin from the ravages of the sun, protecting your car’s paintwork is also an act of preservation, prevention and priority. It doesn’t take long for the daily build-up of pollution, particulates, dust and grime to begin eating into the paintwork. Once oxidation takes hold, the paintwork will lose its sheen and become chalky, preceding eventual deterioration of the top layer, or clear coat. The next phase will see patches of paint dissolving and opening the way for rust. And to think all this hassle might have been avoided simply by giving your car a regular wash. Even so, it's not as easy as sprinkling the car with the garden hose followed by a quick wipe-over with a tea-towel or leaving it to nature to dry. Good quality car cleaning kits are available at auto retailers and supermarkets and should contain all the appropriate items to ensure optimum results. If you can wash the car out of direct sunlight, all the better too. It sounds obvious, but once you’ve washed the car, don’t forget to dry it, because the water you’ve just used will leave behind its own mineral residue. A chamois or cotton cloth will do the job, and one or the other can generally be found in car cleaning kits. Waxing your car is an excellent means of protecting the paintwork, and again, auto retailers have a selection of kits precisely for this purpose. Waxing creates an effective shield against the fierce Australian sun, heat from the engine, and other pollutants. Its glossy effect is another benefit, ensuring your car is always looking its best. 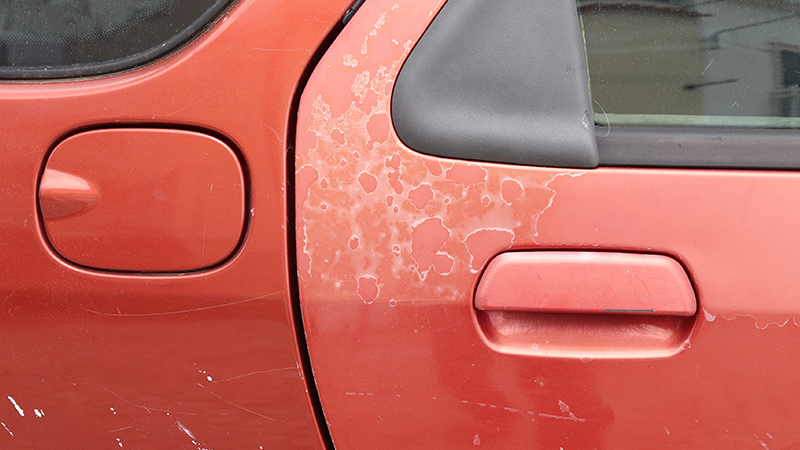 Sometimes the condition of the paintwork has so deteriorated that a complete detailing and spray painting of the vehicle is the only option left. If you have the confidence, capabilities and the right equipment – including the paint, of course – then you can cut costs via DIY spray painting. Otherwise, professional spray painting is the wisest choice and will soon have your car looking a treat. At AutoGuru, we can even help you with your choice of colour. In fact, AutoGuru gives you access to more than 1600 qualified workshops, along with insights from customer reviews. Michael Jacobson is an award-winning Queensland-based writer. His appreciation for motoring began as a young journalist covering racing from Simmons Plains in Tasmania. Over the years he has interviewed many Australian and international motoring greats. He has also been driven around Lakeside Raceway at ferocious speed, circumnavigated the Gold Coast Indy circuit at more than 200kmh and managed to squeeze 365,000 kilometres out of a Toyota Starlet.